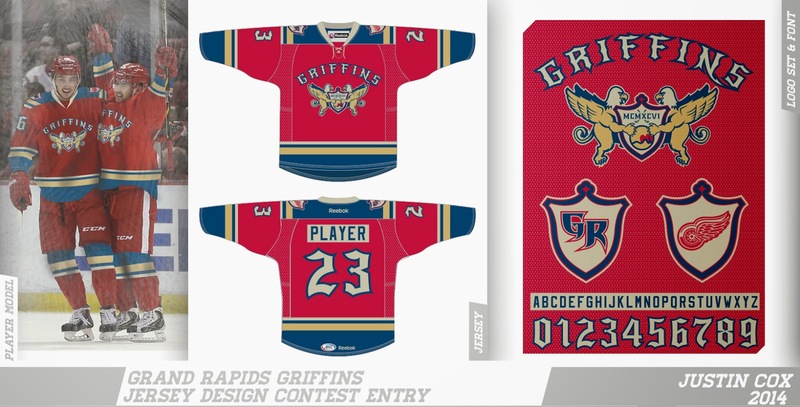 Congratulations to the winners of the Grand Rapids Griffins Alternate Jersey Competition, Mark Roberts and Trevor Ezaki! The winners were chosen by the Griffins and it's became clear on Twitter that many HJC readers did not agree with the team's decision. The team is entitled to their opinion, as are we. With that in mind, here are my top 6 entries into the competition. It was to be a top 5 list, but 6 entries clearly stood out to me. I really like the numerous chest stripes and how the yoke compliments them well. I also like how gold has been used mostly as a perimeter colour. Except of course on the numbers, but I like that. I think I would have gone with a standard block font for the NOB though. The use of a past winner's logo keeps this concept out of the top 5. I really love the fauxback look of the shoulder yokes, primary logo, and numbers. The yokes are great as well. I especially enjoy how they interact with the shoulder patches. I personally like to see the Wings logo left off of the specialty jerseys, so using the same shoulder patch on both sides would have been ideal in my world. I worked with Tom in a very small capacity on this one, but his vision and creativity took it to great heights. I love the primary logo, which by itself may simply be viewed as an eagle's head. When used with the full-body griffin shield shoulder patches it works well. I really like how the yokes and shoulder patches work together. Personally I would like to see the red stripe on the yokes be straight and not curve with it. The squared yokes and collar laces look so good with this logo. The use of simple and classic stripes and numbers will get me every time. 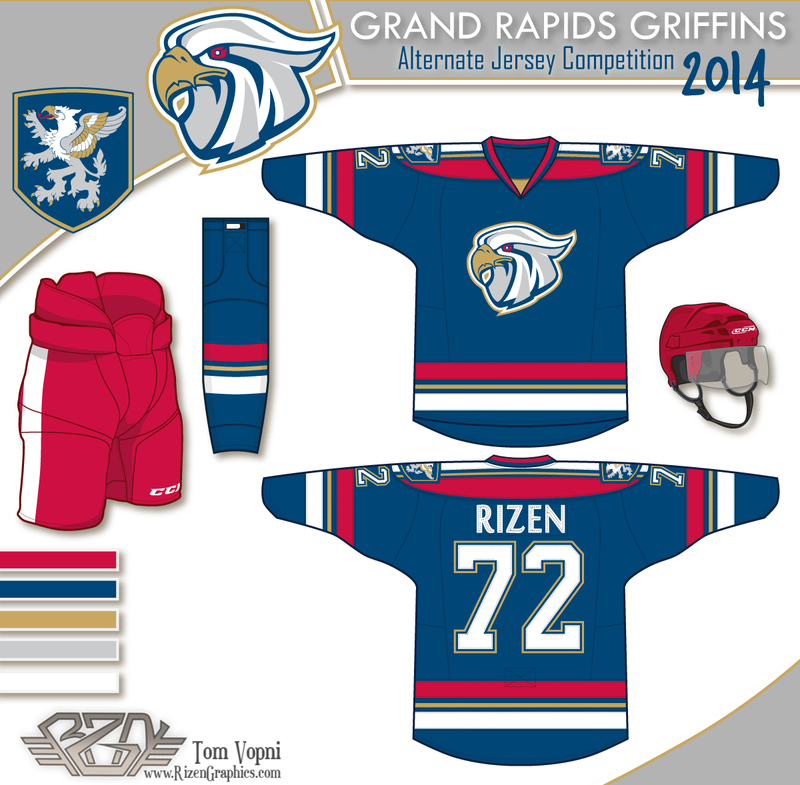 I'd like to see a bolder and slightly more stylized font used for the word GRIFFINS. With so much gold in the logo and broad white stripes on the jersey, it seems that the colour balance is a bit off. Some sort of combination of Justin's and Dylan's entries would probably climb to #1 on this list. What I like best about this concept is that it can work both as a home white or road red sweater. The logo is outstanding. That griffin looks very strong and proud. As mentioned before, I would like to see the Wings logo left off in favour of the circle shoulder patch on both sides. Perhaps what sent the judges away from this concept was the use of the city's flag. That element had been used on a previous winner's entry. This concept is fantastic. 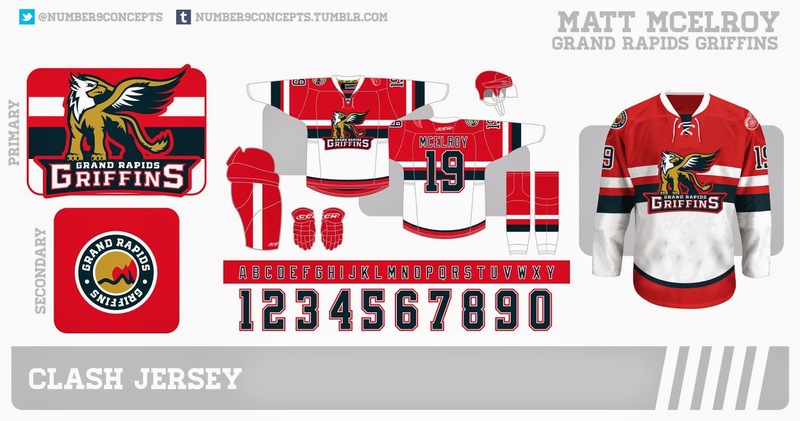 It's simple and classic, yet it would be completely new for the Griffins. I think the number font was a great choice and the primary logo has a lot going on, but it's put together so well that it looks like one piece (as it should). Execution of the concept itself is flawless. 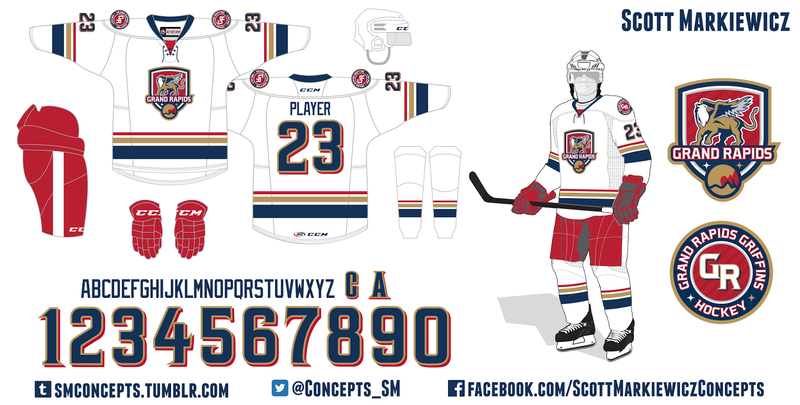 This one also makes sense because teams wear white at home in the AHL. If the home team wears a colour jersey they have to ask the visiting team to travel with another set of jerseys on top of their regular road sweaters. That can sometimes be problematic for budget conscious AHL teams. If I was picking the winner this would be it. My only issue is the shoulder patches which look like they belong with the Washington Nationals' marks. Do you agree with my thoughts? What concept would you have picked as the winner? 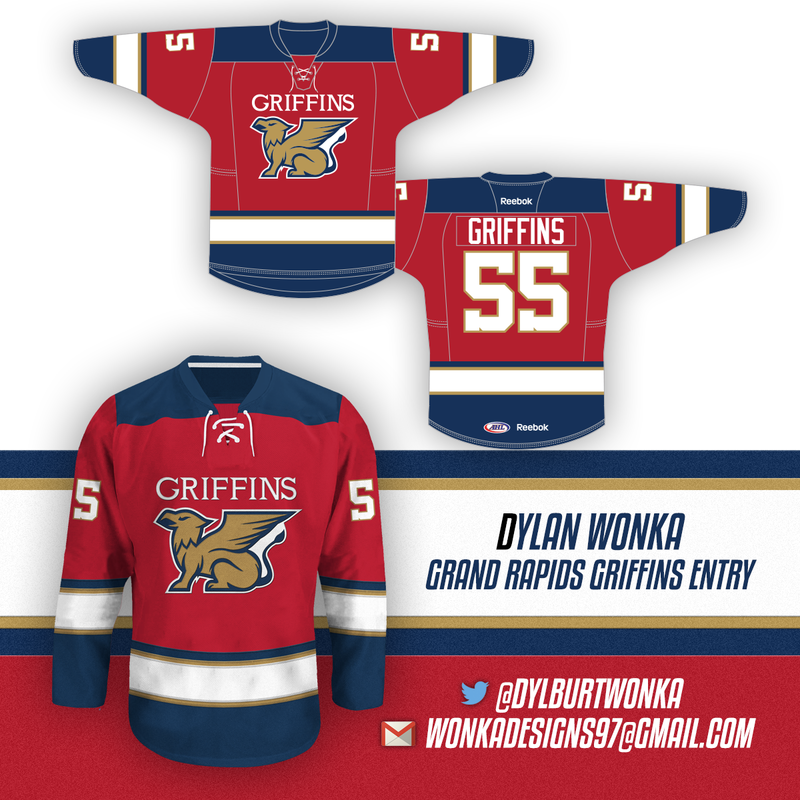 I think the Griffins made decent choices, not what I would have chosen though they still look good.